As Hurricane Florence continues endangering lives and destroying property, many of us wait in uncertainty, wondering how homes, boats, and treasured landmarks are faring. It’s personal and emotional kind of uncertainty, the kind that can’t be addressed by probabilities. But on the statistical side, the National Weather service could not have done a better job of predicting the path of Hurricane Florence, despite the challenges of several high and low pressure systems, two tropical storms and three hurricanes in the region, each with their own degrees of uncertainty. The image below depicts the cone of uncertainty six days ago. The accuracy has been amazing. Storm trackers use a form of probability analysis not unlike that which we use to ensure that our clients will not run out of money before accomplishing all of their financial goals. 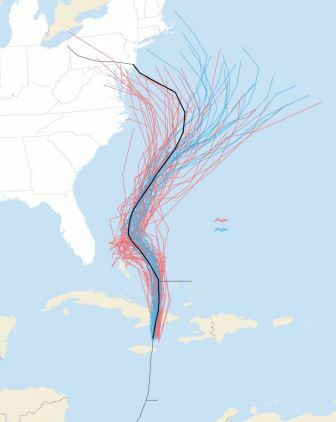 Trackers don’t rely on one forecast, rather they plot numerous scenarios to determine the one that has the highest probability of projecting the storm’s path. The process identifies patterns among the seemingly unrelated, even random interplay between atmospheric, oceanographic temperatures, pressures, and speeds, lunar and solar tidal and gravitational effects, and a host of others. We use a statistical probability process known as Monte Carlo to address our client’s biggest concern – will we be OK? Using it, we can provide our clients with continuing statistical confidence that their goals will be funded with sufficient wealth, regardless of how badly or when the capital markets misbehave. But unlike the weather service, we avoid the temptation to demand confidence in the 90% or higher range, because that level of assurance usually demands an unacceptable level of sacrifice of today’s lifestyle, which significantly outweighs the possibility of absolute worst cases – those that have only a small likelihood of occurring. And, just like the weather service, we continually update our analyses, based on the latest data, to make course corrections as needed. Notice the similarities between the Weather Service’s ‘spaghetti’ plots and our Monte Carlo plots, provided by Money Guide Pro. The weather chart on the left represents many models, which represent hundreds, thousands or millions of iterations each to provide their probable path. Each of the lines on the right represents a virtual life plan (comprised of specific cash flows over time) virtually ‘lived’ through 1,000 randomly selected market conditions known as trials. We model confidence in the range between 75% and 90%. A confidence of 82% means that 820 trials met or exceeded the client’s goals. The remaining 180 trials fell short providing for one or more goals, but did not necessarily run out of money. When confidence dips below our 75% threshold, we make modest adjustments to get the plan back on track, restoring confidence. But statistics only help us answer the big questions related to being OK. As Hurricane Florence so vividly illustrates, knowing where the storm is going helps immeasurably for preparedness and evacuation, but we are still tempted to worry about our loved ones and our property in the absence of better knowledge. Hurricanes are front-and-center emotional events, taking all of the attention of those in their path, and much of the attention of those who watch either with detachment, amazed by the power of nature, or by hanging onto every image they can view to determine the condition of a neighborhood or landmark close to theirs. It’s likely that those who prepared breathe easier than those who did not. In fact, hurricane preparedness, or the lack of it, can teach us a few things about financial life planning. If you found yourself in line at the gas station, wondering if there would be any left by the time you got to the pump, or you were in the grocery store choosing between the last two cans of barley lintel or split pea soup, or at the first flicker of the lights the idea of getting a generator crossed your mind, you might not score yourself very high on the hurricane-preparedness scale. The thing about hurricanes is they are big, loud, and almost impossible to ignore. Financial life planning, by comparison, arguably far more important, seems to be way down our priority list. It’s easy to understand why it suffers our attention, it is not a fight or flight endeavor, we see no immediate threat or need to prepare and the benefits are mostly intangible. At least with a hurricane, once you’ve prepared, or not, there’s almost always a party where you can watch the waves destroy houses and piers, reporters holding on for dear life in wind and rain, but amazingly sounding like they are in the studio, and listen in awe to the guy with the glasses talk about, eyes, walls, pressures, and cones of uncertainty. But with financial planning, the entertainment or threat factors don’t seem to register much enthusiasm. What if I told you that, without much effort, you could create and explore your own ‘cone of uncertainty’ for your financial life? It will help you determine today just what you need to do to prepare for an uncertain future. The really neat thing is, there’s no one or few ways to accomplish preparedness. And the more you align your preparations with your likes, values, and priorities, the more likely you will be to prepare well and consistently. We can’t eliminate your worries, but together we can replace many or all of the financial ones with confidence.